Amazon WorkSpaces is our managed virtual desktop service in the cloud. You can easily provision cloud-based desktops and allow users to access your applications and resources from any supported device. The Bring Your Own Windows 7 Licenses (BYOL) feature of Amazon Workspaces furthers our commitment to providing you with lower costs and greater control of your IT resources. If you are a Microsoft Volume License license-holder with tools and processes for managing Windows desktop solutions, you can reduce the cost for your WorkSpaces (up to 16% less per month) and you can use your existing Desktop image for your Workspaces. Let’s get started. Your WorkSpaces can access your on-premises resources when you extend your network into AWS. You can also extend your existing Active Directory into AWS. This white paper describes how you achieve connectivity and the images below take you through different points of connection. As a part of the implementation, you will create a Dedicated VPC. You will also create a Dedicated Directory Service (the Dedicated Directory option will not be present until the WorkSpaces team enables the BYOL account). You can use AWS Workspaces with your existing Active Directory or one of the AWS Directory Services. Simple AD: Samba 4 powered Active Directory compatible directory in the cloud. Microsoft AD: Powered by Windows Server 2012 R2. AD Connector: Recommended for leveraging your on-premises Active Directory. Your choice of Directory Service depends on the size of your Active Directory and your need for specific Active Directory features. Learn more here. With BYOL, you use your 64 bit Windows 7 Desktop Image on hardware that is dedicated to you. We use your image to provision WorkSpaces and validate that it is compatible with our service. OVA – You provide images for BYOL in the OVA industry standard format for Virtual Machines. You can use any of the following software to export to an OVA: Oracle VM VirtualBox, VMWare VSphere, Microsoft System Center 2012 Virtual Machine Manager, and Citrix XenServer. VM Import – You will use VM import in the AWS Command Line Interface (CLI) (AWS CLI). You execute import image after your OVA has been imported into Amazon Simple Storage Service (Amazon S3). VPC Wizard – You will create several VPC resources for your BYOL VPC. 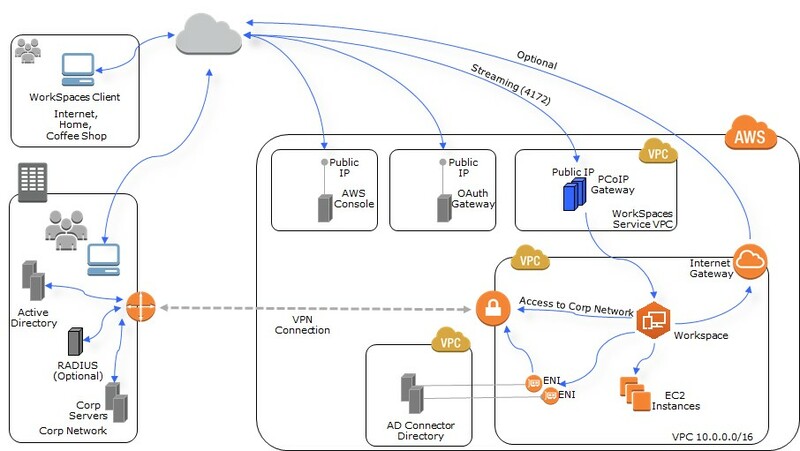 The VPC Wizard can create your VPC and configure public/private subnets and even a hardware VPN. AWS Health Check Website – You can use this site to check if your local network meets the requirements for using WorkSpaces. You also get a suggestion for the region you should deploy your WorkSpaces in. A proof of concept (POC) with public bundles will give your team experience using and supporting WorkSpaces. A POC can help verify your network, security, and other configurations. By submitting a base Windows 7 image, you reduce the likelihood of your customizations impacting on-boarding. You can customize your image after on-boarding and you can have regularly scheduled meetings with your AWS account team to make it easier to coordinate on your implementation. With WorkSpaces, you can reduce the work necessary to manage a Virtual Desktop Infrastructure solution. This automation can help you to manage a large number of users. The Workspaces API provides you commands for typical WorkSpaces use cases: creating a WorkSpace, checking the health of a WorkSpace, and rebooting a WorkSpace. You can use the WorkSpaces API to create a portal for managing your WorkSpaces or for user self-service. 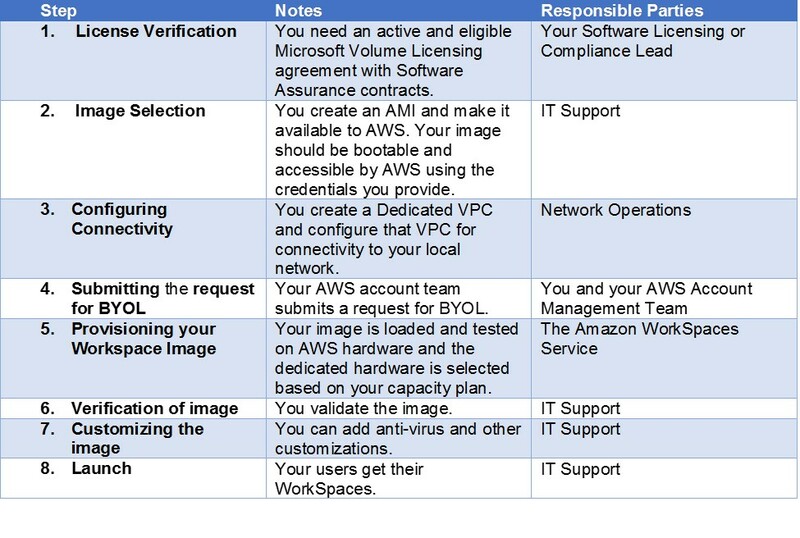 In order to ensure that you are ready to get started with BYOL, please reach out to your AWS account manager, solutions architect, or sales representative, or create a Technical Support case with Amazon WorkSpaces. Please contact us to get started using BYOL here. Learn more about WorkSpaces and other enterprise applications at the complimentary AWS Public Sector Summit in Washington, DC June 20-21, 2016.